November 27 – 30: 1-6pm daily. Friday 28: Leftovers by Julia Sherman & Sarah Keough (2-5 pm)- A collective Thanksgiving sandwich competition (bring your favorite Thanksgiving leftovers). Saturday 29: Where I end and you begin: A Beginner’s Guide to Listening by Kerry Downey (live, 2 pm) + Open discussion between participating artists, curator and guests on hospitality as tool and premise (4 pm). 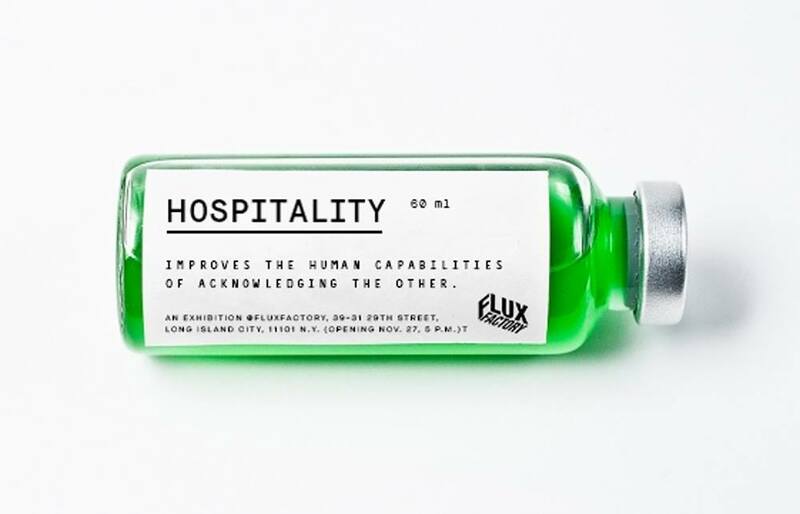 FLUX HOSPITAL is an exhibition on social art practices that use and address hospitality as a central human force and resource. Through the artworks presented in the exhibition, made by a group of international artists, FLUX HOSPITAL asks: What is hospitality and how is it used as an artistic tool? Acknowledgement, empathy, dialogue and inclusion are some of the key terms ascribed to social art practices, and FLUX HOSPITAL is a way of discussing these as proposals to think, act and meet other human beings in hospitable ways. Not to simply attack the xenophobia of contemporary life and culture, but also to argue that dialogue and acts of sharing can lead to bigger experiences, knowledge and happiness. And what better occasion could there be to celebrate hospitality than the American tradition of Thanksgiving? With works by: Kerry Downey, Sandy Smith (UK), Dillon de Give, Julia Sherman & Sarah Keough, Kenneth A. Balfelt (DK), Douglas Paulson & Rancourt/Yatsuk, Walker Tufts, Ayden LeRoux, Will Owen and artists from Flux Factory. Curated by: Matthias Borello (DK). Matthias Borello is a Danish critic and independent curator focused on art practices, exhibition formats and curatorial strategies within social practices. In 2012, Matthias curated the international festival Visit Tingbjerg 2012 in a Copenhagen suburb. In fall 2014 he will publish a book on social practices in collaboration with Danish artist Kenneth A. Balfelt. Matthias currently lives in Copenhagen, where he is the co-founder and editor of the Danish art publication KUNSTEN.NU. Beside all of that, he loves drumming in any form.